Stilettos Diary: Qvendo.com presents Style Rendezvous. Surprise giveaway and a unique competition on my blog. WIN CHRISTIAN AUDIGIER HANDBAG AND GET FEATURED ON QVENDO.COM BLOG !!!! I am extremely happy to announce Style Rendezvous (Style to win.) along with Qvendo.com. Create a polyvore, using items on Qvendo.com that defines your style. 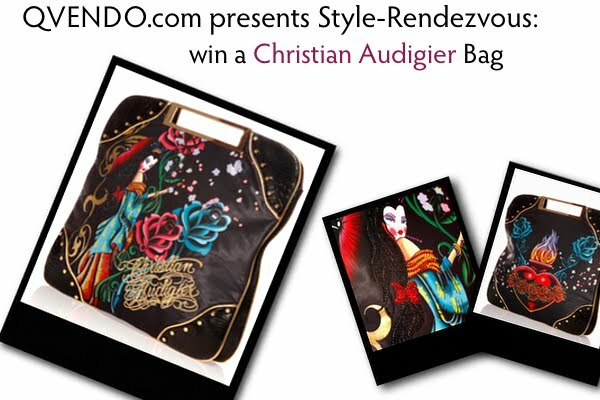 Get a chance to win a Christian Audigier hand bag and get it featured on the Qvendo.com blog! The Polyvore Editor is a free, easy-to-use web-based application for mixing and matching images from anywhere on the web to create fashion looks. I SHALL PROVIDE THE BASE ITEM ON WHICH YOU SHOULD STYLE. The base item is a pair of coloured jeans (red jeans as shown in the above polyvore). Now tell us how you would style a coloured jean USING ITEMS FROM qvendo.com. 1. JOIN MY BLOG VIA GFC OR GOOGLE PLUS PAGE. 2. LIKE QVENDO.COM FACEBOOK PAGE. 3. LIKE STILETTOS DIARY FACEBOOK PAGE. BRING OUT YOUR CREATIVITY. CREATE A POLYVORE JUST LIKE I HAVE. It’s very simple. You can create amazing style with the amazing templates present. I have given detailed step by step instructions. Though it looks long, creating a polyvore actually takes just 10 minutes! I shall be featuring all the polvore sent to my email id on my Facebook page as well as on my blog regularly. Qvendo.com will decide the winner based on the person who is the most creative and stylish. Let your creativity out. Waiting for all your wonderful entries. If you guys have any queries leave a comment on my blog. I shall revert back. If not you guys can email me your queries. Competition closes on 31st DEC 2011. SEND YOUR POLYVORE NOW!! Hi..the base item is red jeans. Tell us how you would style it using items from qvendo. com. If u dont find red jeans in the sale. Not a problem. Don't add the red jeans. i've submitted my entries at the beginning itself. forgot to comment on ur blog as i was not feeling well. i would surely like to get that beautiful bag as giveaway.